Get ready for simpler designs and new features on your smartphone apps, with developers applying the stripped-down concepts they employed for the Apple Watch. When building an app for Apple Watch, Mikael Berner and his team at EasilyDo quickly learned that their work could carry over to the iPhone. The EasilyDo developers found it sometimes took too long for users to find the information they wanted in the company’s namesake app — which acts as a virtual assistant by managing your email, calendar, travel information and services like LinkedIn. When you’re wearing a smartwatch, you need to be able to glance down and see what you’re looking for without digging through menus. Deciding that also made sense on the iPhone, the developers restructured their smartphone app to also be “more micro-moment,” said EasilyDo CEO Berner, showing quick glances of information that’s relevant to what you’re doing at a particular time. If you’re heading out on vacation, it won’t display a menu with all of your travel information, as the phone app did before. Instead, EasilyDo will notify you about gate changes or pop up your boarding pass while you’re in the airport. It then will display your hotel’s address after you land or provide other information based on what you need in that moment. Apple Watch hasn’t hit the market yet, but its tiny screen is already changing how our iPhone apps look and feel. Some of the simple, “glanceable” functions found on Apple’s first wearable will make their way to smartphone apps, as will more minimalist designs. And it’s not just about making the phone and watch apps work together seamlessly, but actually incorporating watch features — like new functions and different design schemes — in the iPhone. The result, developers hope, is less digging through menus and a streamlined experience for users. “A large population is going to get used to the nibbling the watch lets them do,” Berner said. Not all companies will make tweaks to their iPhone apps that are obvious to users, but others, such as EasilyDo, American Airlines, BetterWorks, Citi and Evernote, are making changes to their main phone software because of the watch. Apple Watch, which Apple first unveiled in September, costs $349 to $17,000 and hits the market on April 24. The device — which comes in three models, two sizes, a couple metal finishes per model, and with various bands — requires an iPhone 5 or later device to operate and can do very little when not connected to a smartphone. Apple is counting on its first smartwatch to become a strong seller alongside the iPhone, as well as become a way to get people to buy more smartphones. Whether Apple Watch succeeds or fails is closely tied to the apps available on the device. While there’s no clear “killer app” that makes Apple Watch a must-have device, Apple and its app partners have given users many reasons to at least consider buying the pricey wearable. Apple made its case at a press event last week,showing how you’ll be able to call an Uber carusing the watch or unlock your hotel room door. You’ll also be able to check in for a flight or turn off your house lights using a tap on your wrist. Initial watch apps are largely an extension of the main iPhone app, providing users with quick notifications and fairly limited abilities. Simplicity is key, and so far, there are few things you can do on an Apple Watch that you can’t do with your phone. But features that were created for the smartwatch will also be trickling upstream to the iPhone. Take BetterWorks — an app that lets you set goals at work, monitor your progress and keep others in the loop. The company is incorporating some design changes in its iPhone software thanks to its Apple Watch work. In a future iPhone app update, it will include animations and new ways to present data it hadn’t considered before, said BetterWorks CEO Kris Duggan. Instead of presenting long lists of goals, the app will take a more minimalist approach. BetterWorks may even redesign the Web browser version of its program based on design learnings from the watch, Duggan said. American Airlines, one of the app makers highlighted at Apple’s recent events, has created an app that gives users flight updates and displays their boarding passes. One feature, called the “Travel Cue,” includes a countdown to flights and pops up relevant information. The airline is changing one of the main displays in its iPhone app to also show Travel Cue, said Kevin MacFarland, American Airlines’ director of mobile and online strategy. Evernote, the popular note-taking app, also has developed a new feature for its Apple Watch app that will make its way to the iPhone. A new personalized note list tries to predict the top five notes you’d want to see in a certain situation based on your location, calendar and your personal usage patterns. For instance, one of the top notes may be business card information for participants in a meeting you’re about to attend. The personalized note list will appear on Apple Watch and will also be integrated into the Evernote “today widget” that pulls down from the iPhone and iPad notification center. That widget previously just showed your most recent items but now will also include the predicted notes you may want. If users end up liking the feature, Evernote may expand similar functionality to other areas. Developing for wearables also has gotten Evernote’s team talking about whether it should rethink how it lays out all notes in the future, Hull said. If the company becomes good at making predictions, it may reorder note lists based on what it thinks you need, offering a special section in the Evernote app for you to grab the notes instead of performing a search. Other early Apple Watch app makers — including CNN, Expedia, Starwood Hotels Group and Trivia Crack — aren’t making noticeable changes to their iPhone apps. Expedia hasn’t done anything differently with its iPhone app, at least so far. Its Apple Watch app essentially provides you with an “itineraries experience,” showing information related to flights, hotels and car rentals. That’s something Expedia’s iPhone app already does, though the information in Apple Watch is presented in a simpler way. CNN has made some tweaks under the hood to its smartphone app, allowing for more deep linking of content to send you to a live news video or stories related to a news blurb you see on your watch. Designing for wearables may “inform the way we build phone and TV apps, but right now it’s just more important they feel they’re part of that ecosystem and [are] talking to each other in a substantial way,” said CNN Chief Product Officer Alex Wellen. But other app makers plan to completely redesign their phone software. In the case of Citi, the bank created an entirely new iPhone app to interact with Apple Watch, called Citi Mobile Lite, but it plans to discontinue that app after it redesigns its main iPhone app, Citi Mobile, said Heather Cox, chief of client experience and the digital and marketing officer for global consumer banking at Citi. Consumers who are used to dealing with simple, elegant apps from companies such as Uber and Nest expect the same characteristics in their banking apps, she said. Citi plans to bring features of Citi Mobile Lite — such as a bigger font, less data cluttering the screen and an overall flatter design — to its main app in the coming months. It’s something the company had hoped to do for awhile, and Apple Watch’s release presented the right timing. “It’s our opportunity now to shift,” Cox said. Citi also created a new feature that shows you how close you are to reaching your spending limits. A blue notification bar on the watch app turns orange when you reach 80 percent of your limit. It changes colors again, to red, when you’ve reached your full limit. The spending limits feature will debut first in the Apple Watch app but will appear in the Citi iPhone apps shortly afterward. Blackberry-owned company Secusmart has unveiled a new tablet in collaboration with Samsung and IBM. The Secutablet is “based on” the Samsung Galaxy 10.5 and runs on Samsung hardware, the firm said. The additional security it offers is aimed at businesses and governments, but less vigorously protected social media and video platforms can also be used on the device, Secusmart added. The tablet is likely to be priced at $2,380 (£1,609), according to reports. The Secutablet is compatible with Blackberry 10 and is currently undergoing security certification at the German Federal Office for Information Security. It incorporates IBM’s “app wrapping” technology which adds extra layers of security to sensitive data. “Security is ingrained in every part of Blackberry’s portfolio, which includes voice and data encryption solutions,” said Dr Hans-Christoph Quelle, CEO of Secusmart GmbH, a Blackberry company. 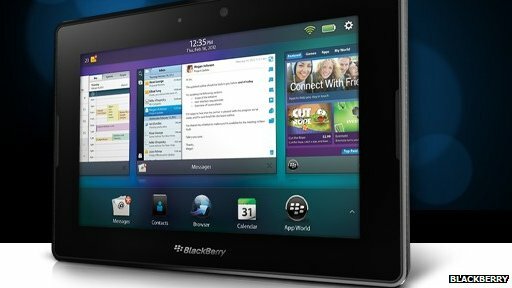 Blackberry has struggled in the tablet market, and its PlayBook device did not hit sales targets when it was launched in 2010. It acquired German voice and data encryption firm Secusmart, in December 2014, and the Secutablet was unveiled at tech fair CeBit in Hanover at the weekend. “Historically Blackberry has been strong in Germany because of its high-end security offerings,” said analyst Nick McQuire, vice-president of enterprise at analyst CCS Insight. “Clearly the Secutablet is designed to play into Blackberry’s core focus of high grade security. “The price point is quite expensive – part of the target base is going to be people who can afford to deploy a tablet at that price,” Mr McQuire added. There has also been speculation that the device will be Android-powered because of the Samsung hardware. “It is highly likely – but not confirmed – that it will run on Android given that Samsung is a partner, and given Blackberry’s focus on becoming more of a cross-platform security company,” Mr McQuire said. “One of the things they will want to be known for is to be a mobile security company. Even in the Secusmart business, you can’t be entirely platform specific. The Secutablet might face competition from the likes of privacy platform Silent Circle, which unveiled the next generation of its security-focused smartphone Blackphone 2 at Mobile World Congress in March, Mr McQuire said.